I have four acorns sitting on my dresser right now. I picked them up while hiking in Dundas last year. I’ve realized that oak trees, especially the giant oaks rooted along the escarpment remind me of a Grand Rapids, Michigan neighborhood I grew up in. At their tallest some oak trees can reach over 30 meters. The white oaks are known for their waterproof wood (great for making barrels) and can live for an astonishing 600 years. During a mast year (bumper crop), a single oak tree can produce upwards of 10,000 acorns. Those acorns provide a high-nutrient meal to squirrels, deer, and lots of other animals. They are giants not just in their physical size, but also in the way they contribute to the health of their ecosystems. Their majesty is not lost on scripture. Describing God’s redeemed people, Isaiah writes: “You will be called oaks of righteousness, a planting for the display of God’s splendor.” (Is. 61:3) Oak trees serve as a living metaphor to help us catch a glimpse of what we are to be like. What strikes me is that each and every one of these oak trees begins as an acorn – and not just as the picturesque acorns sitting on my dresser. While we could romanticize its journey from seed to seed producer, the reality is that an acorn only becomes a mature oak through vulnerability. An acorn falls to the ground. The wind might blow it loose, but the acorn drops with a thud. It’s not afforded any of the gracefulness with which a leaf gently floats back and forth from branch to ground. Acorns come crashing down – and often bounce from hitting the ground so hard. They sit in the dirt until something eats them, someone tramples them under foot, or they get buried under leaves, branches, and dirt. 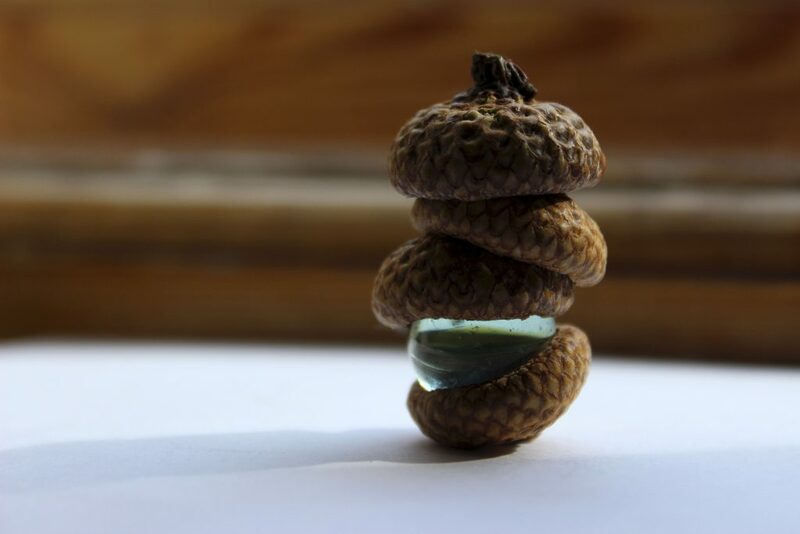 And then, in order to germinate and grow, acorns ultimately need to split open their outer casing. I wonder what this metaphor means for us, as followers of Jesus Christ. Paul writes at one point: “for Christ’s sake, I delight in weaknesses, in insults, in hardships, in persecutions, in difficulties. For when I am weak, then I am strong.” (2 Corinthians 12:10). That message is so completely opposite of what our culture teaches us that it’s difficult to understand. Admittedly, the unbroken acorns on my dresser evoke a sense of nostalgia for me. They draw me back to the familiar neighborhoods and faces of my childhood. There is even a sense of safety and assurance that comes to the surface for me, just by looking at those four little acorns. But the Christian life doesn’t call us to safety or comfort, or even to nostalgia. Rather, following Jesus Christ is most often characterized by an emptying of ourselves (Philippians 2:6-8), by leaving what is familiar (Genesis 12:1-9) to keep in step with the Spirit’s leading today (Galatians 5:22-26). And that way of living is one of repeatedly dying to ourselves, of embracing our own vulnerabilities and weaknesses as an essential element of our discipleship. Andy Crouch writes: “Flourishing requires us to embrace both authority and vulnerability, both capacity and frailty – even, at least in this broken world, both life and death.” The question then is not so much whether we desire to contribute to the flourishing of others, to be like mighty oaks of righteousness in our homes, neighborhoods, and vocations. Rather, are we willing to embrace our vulnerabilities like acorns? Will we humble ourselves and offer God our weaknesses just as much as our strengths?